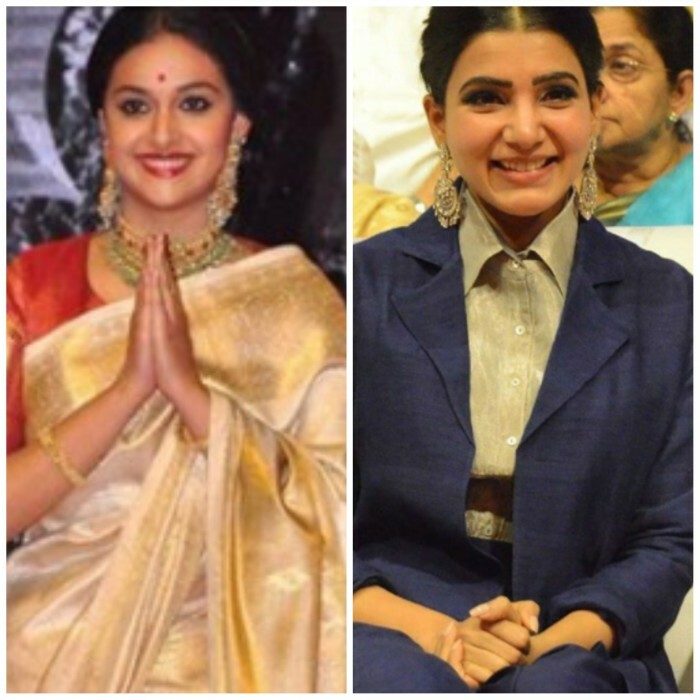 Home » Telugu » Samantha And Keerthy Suresh up the style quotient at Mahanati audio launch! Samantha And Keerthy Suresh up the style quotient at Mahanati audio launch! Both the beauties, Keerthy and Samantha looked gorgeous in their outfits and we just can't get our eyes off. The biopic of Savitri, directed by debutant Nag Ashwin, is definitely the much-talked-about film of the season. While there are many biopics lined up this year for the release, Mahanati is the first one to hit the silver screen. Yesterday, the much-awaited audio of the film Mahanati was released, attended by the cast of Mahanati. Dulquer, Vijay, Samantha and Keerthy. The stars were seen in their best fashion sense. Both the beauties, Keerthy and Samantha looked gorgeous in their outfits and we just can’t get our eyes off. 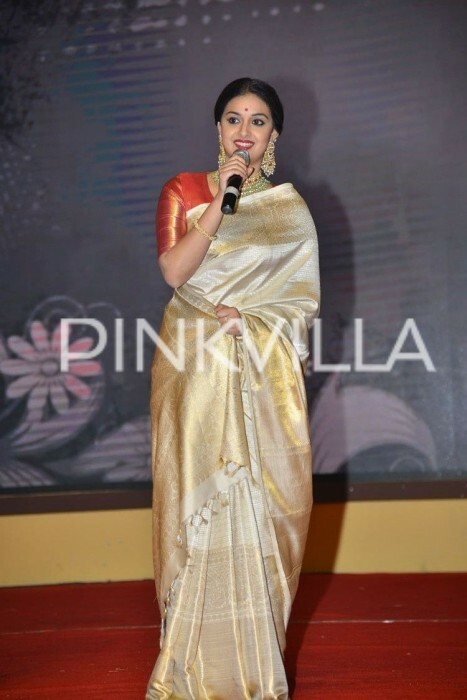 Keerthy Suresh looked elegant in a traditional look at the audio release of Mahanati. The actress picked a cream Kanchi silk with a bright red blouse and totally love the way she is carrying so effortlessly. She rounded off her look big earrings, choker, glossy red lips, hair in bun and bindi/ That smile on her face throughout the event made her look more flawless! On the other hand, the gorgeous Samantha attended the music launch of Mahanati in a stunning blue outfit. The blue and silver combo totally stood out. The high waist pants totally suited her best! We are in love with her this fabulous look! What about you? Talking about Mahanati, this is one of the most talked about biopic in Tamil and Telugu cinema. The film will showcase the life of the yesteryear Telugu actress Savithri. produced by Swapna Dutt under the banner Vyjayanthi Movies, Mahanati has a stellar star cast. Directed by Nag Ashwin, Mahanati will feature Keerthy Suresh as Savitri while Dulquer Salmaan will be seen playing Gemini Ganesan. The lead role is played by Keerthy Suresh while Samantha plays a journalist. Mahanati is slated to be released on May 9th, 2018 worldwide and will be one of the most watched out for film in Tollywood this year. After watching NenuSailaja, Agnyathavasi…I can’t even imagine KeerthySuresh donning those critical expressions which are famously done by Savithri. Going by the looks, she seems to be a perfect choice. Samantha may not be a great actress, but she managed to get the stardom much before her marriage. Yes, even aft mrg she got Rangasthalam, the biggest hit in her account. Looks like this Samantha girl has gone overboard with surgery. Or maybe she cried….dont know….she looks strange. Keerthi looks so fab. Her speech was quite nice as well. Hope this movie is a hit. Wow Keerthi sure knows how to dress up!!! Keerthi looks georgeous. Samantha….WTF happened to her face and eyes? She used to be so cute!